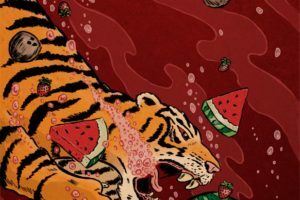 Illustrator Scott DuBar’s five tips for how to successfully complete a daily drawing challenge. A 365 Drawing Challenge, also known as a Daily Drawing Challenge, is one of the best ways to improve yourself as an artist. If you are not familiar with 365 Challenges, they are based on the simple idea that if you want to get really proficient at something, spend a little time each day for one year doing it. You will be amazed by the results! (This technique, by the way, can be applied to anything you want to improve at; from writing to cooking, photography to exercise.) Posting your progress regularly online helps give additional motivation, since friends, family (THE WORLD!) will be able to track your progress and follow you to ultimate victory, or uncompleted defeat. 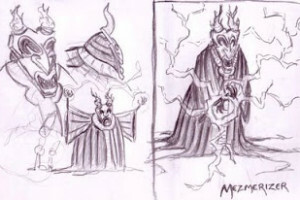 I first learned about 365 Drawing Challenges when I came across an article on Pixar animator Everett Downing, who was challenging himself to create a unique superhero or supervillain every day for one year. This seemed like a great opportunity for me to further develop my own superhero character I had been working on, Kid Hercules. 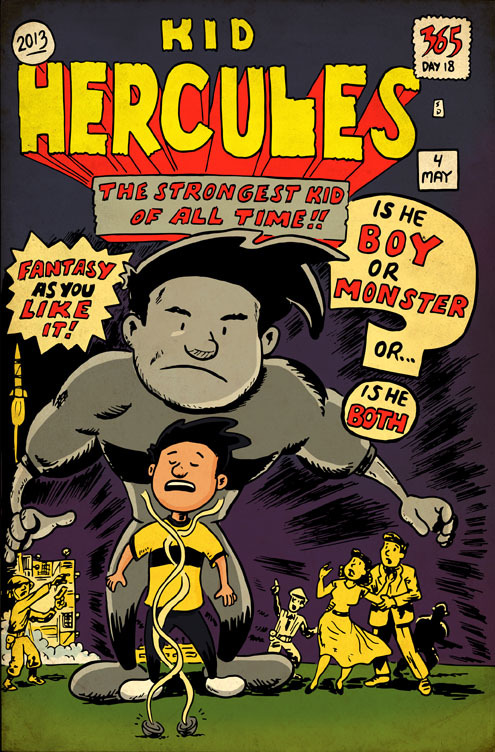 I was so excited by the idea, I didn’t plan out a single thing beyond “draw Kid Hercules doing something heroic every day.” I quickly ran into many roadblocks and found myself scrambling to improvise a way to keep up the challenge. Here, then, are five tips to help you get your own 365 Drawing Challenge started off without a hitch, and to make sure you keep going every day. 1. Have a clear plan ahead of time. 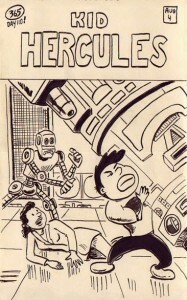 My 365 Drawing Challenge plan was to do daily drawings of my superhero character, Kid Hercules, the star of a graphic novel I am developing. Unfortunately, I didn’t realize how quickly I would run out of ideas for what to have him doing. Since my main objective was to simply work out being able to draw my characters consistently from every angle, I got the idea to put my characters in the place of iconic comic book covers. I found it so helpful and rewarding (not to mention much faster), that I started creating boards on Pinterest to collect a variety of comic book art, children’s illustration, and photography that I felt my characters would fit well into. Not only did I learn a lot from copying other artists, I was able to work out a variety of design issues with my characters, and to gradually learn more about their personalities and how they might interact with each other. Another thing I did, based on a friend’s suggestion, was to devote a few days’ worth of drawings to create each frame of a walk cycle. I did this in a Moleskine, so I had to use a ruler to try to keep my ground on the same level, and had to take a little extra care to keep Kid Hercules from growing or shrinking too much from frame to frame. In the end, I had everything I needed to put together a simple animated walk cycle. Even if you’ve never done animation before, it’s very easy to find a walk cycle reference to follow, and really gratifying once you’ve pulled it off! 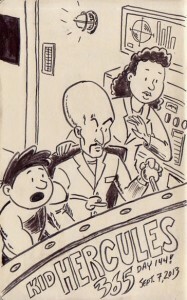 Lastly, I made a point to keep up with the latest drawing prompts from IllustrationFriday.com. It wasn’t so helpful in my case because pretty much none of their prompts were suitable for my particular project. However, each time I did an illustration based on their word prompt, I did a finished, full-color piece. 2. Pinterest is your friend. If you are not already using Pinterest, I highly recommend it. Pinterest lets you collect images from anywhere on the web and organize them into “boards.” You can visit my Pinterest page to see how I utilized it. 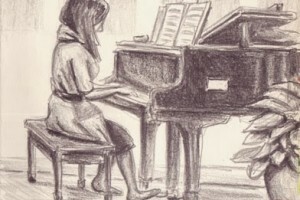 Start collecting references and inspiration for your daily drawings. In the process, you will learn so much just by making a habit of looking at art on a regular basis, particularly art you want to emulate. Just make sure you start collecting plenty of reference images well before you begin your Drawing Challenge. I got so much out of the experience, I still use Pinterest to this day, even long after I finished my 365 Drawing Challenge. Download the app for your phone or tablet and have your references with you wherever you go! 3. Make sure you always have backup supplies. 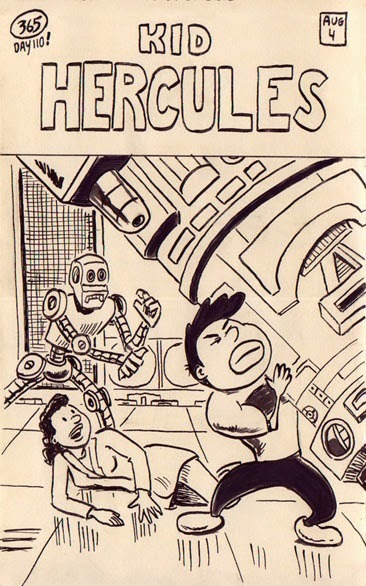 Whether it’s extra pencils, pens, or sketchbooks, make sure you never have an excuse for not drawing. If you are using pencils, make sure you have a couple of pencil sharpeners. If you are using a mechanical pencil, make sure you have plenty of extra leads. If you are inking, Pentel makes really awesome brush pens to help you avoid the hassle of carrying around messy brushes and bottles of ink. Make sure you can easily carry your supplies with you wherever you go. I use a laptop bag for my art supplies. I don’t even own a laptop (never liked them), but I like that people just assume that’s what I’m carrying- makes sketching suddenly seem much more professional! It also has nice storage for spare pens, pencils, etc. 5. Don’t worry about making or posting a fully finished drawing every day. When I started my 365 Drawing Challenge, I made a point of penciling, inking, and shading my drawings every day. Since I was also thinking up my idea for the drawing on the spot, this approach took up way too much of my time. (See: Have a clear plan ahead of time.) To be honest, I was worried that the Internet would judge me for not really completing the full drawing in one day. 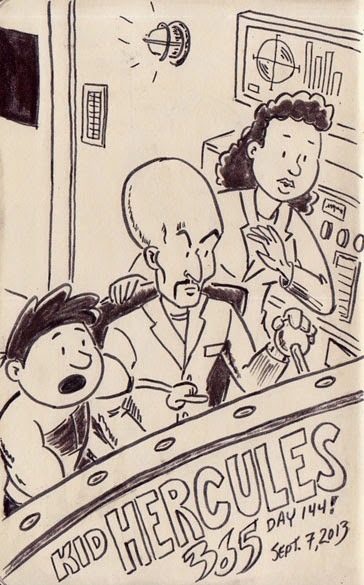 Initially, I switched to penciling the drawings during the week and getting caught up on inking over the weekend. Even this started to become impractical, so I just dropped the inking altogether. This freed me up to focus on what I considered the most important part- drawing every day. However, this turned out to be a real boon because it meant that once I completed my 365 Challenge, I was able to go back and essentially do it all again. So not only did my drawing improve, but my inking as well. 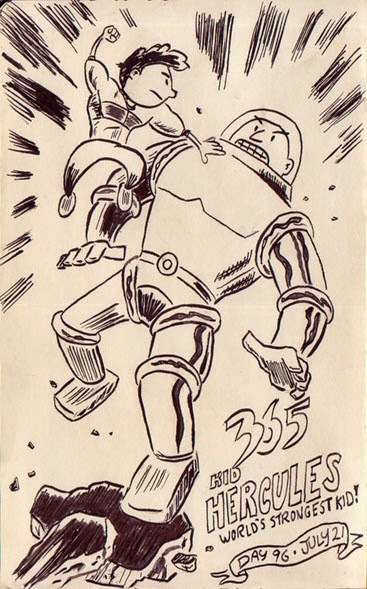 In regard to posting my work online, my decision to only post fully inked images meant that I quickly fell behind following even a weekly schedule. I also chose to scan my drawings rather than simply taking cell phone pictures which can be fairly tedious and time-consuming, and made daily posting far too impractical. The bottom line is: this is your project. Use it to improve your skills and to have fun while doing it. Don’t get bogged down trying to do things that aren’t essential to your primary goal. 1. Became a much better and faster illustrator. 2. Improved my thinking process when doing client work. 3. Learned more about illustrators whose work I admire, and discovered artists I was previously unaware of. 4. Gained a sense of real accomplishment. Even now, anytime I look at my online collection for all 365 drawings I did, I can’t help but be a little impressed with myself that I did nearly 400 drawings! It also helps to keep me motivated, having something like that to remind me of what I can accomplish when I put my mind to it. Bonus tip: If you miss a day- own it. Mark it down in your sketchbook and move on. I put a big X mark on the page for each of the two days I missed. Initially, I felt so bad I thought I would have to quit or start over from the beginning. After a little reflection, I came to the conclusion that I had come too far (I was roughly halfway done at the time) to do anything but soldier on ahead. I’m glad I did! 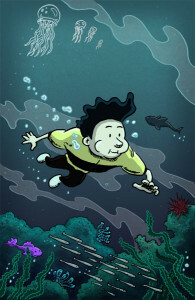 You can see all the illustrations I did for my 365 Drawing Challenge over at KidHercules.com. 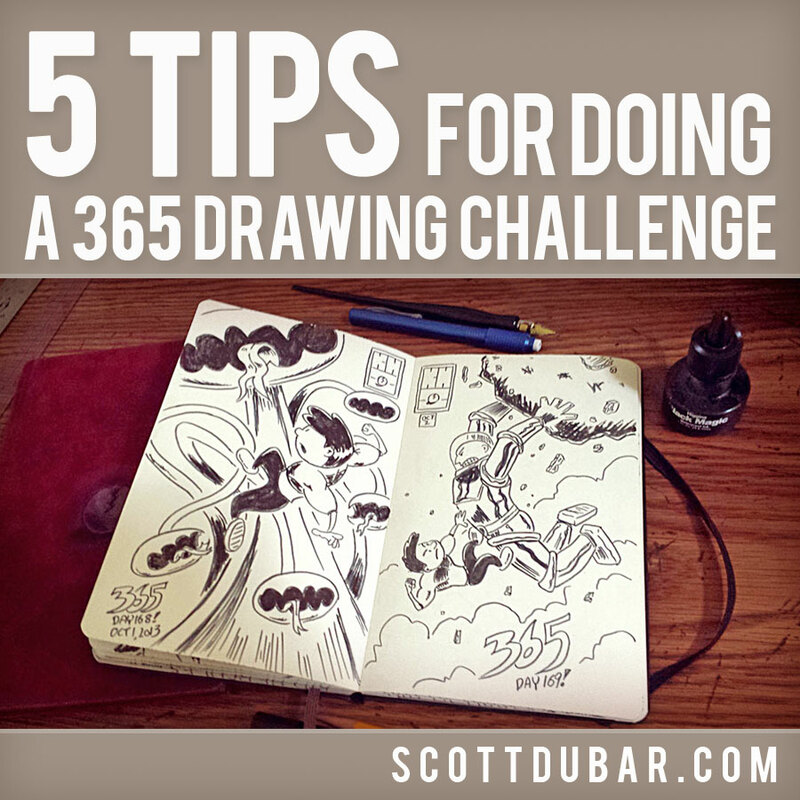 Looking for more helpful tips to complete your own 365 Drawing Challenge? Try out some of the links below!